Hoof rot in horses is actually referred to as thrush; it's caused by the same bacteria that cause hoof rot in cattle, sheep and goats. If your horse contracts thrush, it's your wake-up call to examine and change his living conditions, which is also an integral step toward treating this condition. You must treat the affected foot with an antiseptic for seven days, then remove treatment for another seven and repeat this pattern until the condition clears. Hoof rot occurs in cattle, goats and sheep; the proper name for this type of hoof infection in horses is "thrush," or pododermatitis. The bacteria that cause thrush thrive in dirty, moist and muddy environments. Keep your horse's stall free of urine and manure and keep his stall bedding dry. If your horse stays in a pasture in wet conditions, remove manure from areas he frequents; if possible, move his water tank and hay to a dry, clean area. Checking and cleaning your horse's hooves daily will help prevent the bacteria from settling inside his frog -- the section of the hoof contained within the V-shaped grooves at the bottom of his hoof. At a minimum, you can catch any early onset of thrush and begin immediate treatment. If you notice an unusual and nasty smell when you pick up your horse's foot, you should suspect thrush, particularly if accompanied by any type of discharge. In some cases, you might draw blood if your hoof pick touches his frog, particularly in the central sulcus. 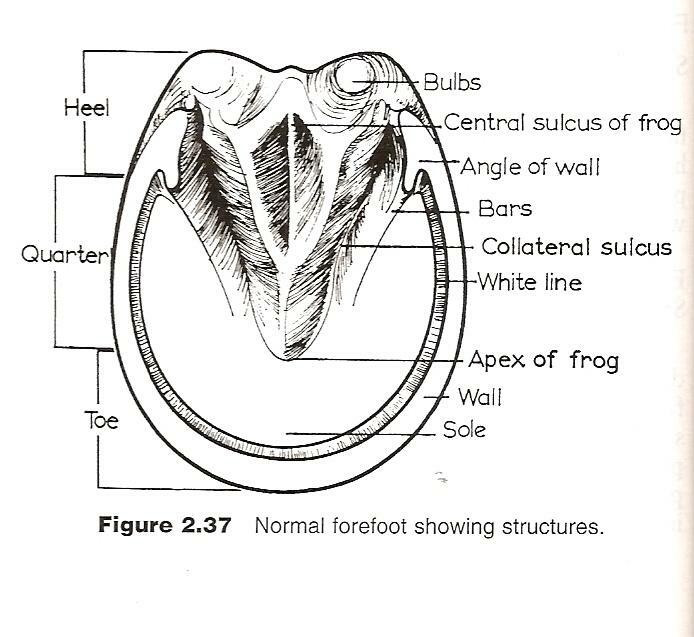 This is the small indentation in the middle of the frog toward the back of the hoof, which is where the infection typically occurs. If the infection is bad enough, your horse may be sore enough for you to notice some minor lameness on that leg. Or, she may try to pull her hoof away when you clean it. Often times your farrier can detect an early onset of thrush during your horse's regular shoeing or hoof trim. If your horse is extremely reluctant to have his hoof cleaned or is lame, consult your veterinarian immediately. Several over-the-counter treatments available at feed stores and tack shops are effective in treating thrush, so if you use one of these commercial treatments, follow the directions carefully. You can also use a disinfectant you may already have on hand, such as povidone-iodine, commonly sold under the brand name Betadine. Soak a small cotton pad with the disinfectant. Then, using a hoof pick, gently push it into the central sulcus of the frog. This allows the medication to penetrate deeply into the infected area and widens the sulcus so that oxygen can penetrate the area, helping to kill the bacteria. Replace with a new disinfectant-soaked pad daily for seven days, then stop treatment for another seven. Repeat this pattern until any odor and discharge are gone. Thrush can be stubborn, but most cases are easily treated with this method. Some horse owners treat thrush with bleach, but this can cause severe dryness in your horse's frog. Ask your veterinarian's advice if bleach is your only temporary option. NOTE: Keep your horse's feet dry during this treatment period. A large stall, with bedding changed daily, is ideal, or a dry arena or pen. You can also purchase a temporary boot to put over the affected hoof if your horse needs to be turned out, or if the weather doesn't allow for dry conditions. Your horse may succumb to other infections similar to thrush that also appear during wet and moist conditions. Rain scald, greasy heel and scratches are some names you may hear fellow horse owners mention, as well as dermatophilosis. Some of these may appear as lesions on the foot or legs, but the same antiseptics that are effective against thrush also typically work well for these conditions. Other horses, and even you, can contract dermatophilosis from your horse, so wash your hands, shoes and clothing carefully when treating a horse with any skin condition, as well as any grooming tools you use on the infected horse.